If you follow me on Twitter, you've most likely heard me talk on and on about Cake Day since the weekend. You've also probably read my recap of that glorious day from earlier this week. And now you get to read one more! Because there is never such a thing as too much cake, right? I think my favourite part of cooking or baking is always the planning stage. As much as I love to physically be in the kitchen, there’s something so invigorating and inspiring about researching recipes. You can get so many ideas, and one recipe can lead to new recipes, as you start adding your own inspirations and techniques to the process. It's such a creative process, and I often find myself overwhelmed with a long list of things I want to cook and bake in the end. Cake Day was no exception, as I found myself staring at a longlist of cakes I wanted to bake for the big day a few weeks ago. I really hadn’t given chocolate cake much thought for Cake Day when I started my recipe research. I figured a few other folks would be claiming chocolate cakes, and that would allow me to play with some other flavours. I flirted with the idea of cakes with nuts—maybe almonds with citrus flavours or the classic combination of hazelnuts and chocolate. There were thoughts of cakes with fruits, like local strawberries or mangoes, to keep things fresh and light. I even contemplated Asian flavours—matcha and adzuki (red) beans, or black sesame. 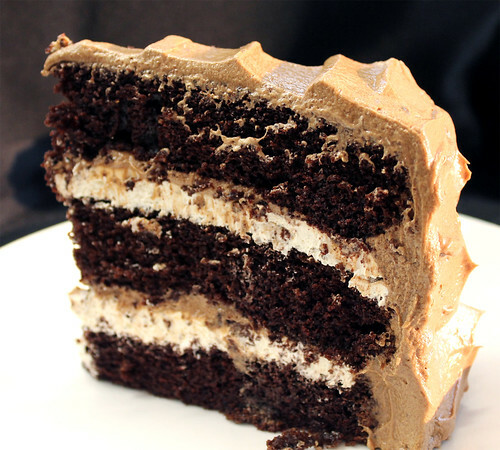 But the instant I saw this recipe from Sweetapolita for Chocolate Cake with Toasted Marshmallow Filling and Malted Chocolate Buttercream, I knew this was the one. Say whaa?! Toasted marshmallow? Chocolate? Malt? How could I resist such flavours?! The combination of marshmallow and chocolate reminded me of s’mores, without the graham cracker element. I especially love the use of malt here—it brought me back to memories of my childhood when my mom would give me a glass of Ovaltine (mixed with a little Nesquick chocolate syrup, of course!). I only hoped the cake would taste just as good as it sounded (and looked in the photos). Like with most recipes, I did tweak a few things from the original. I definitely cut down the sugar for each element of the cake. 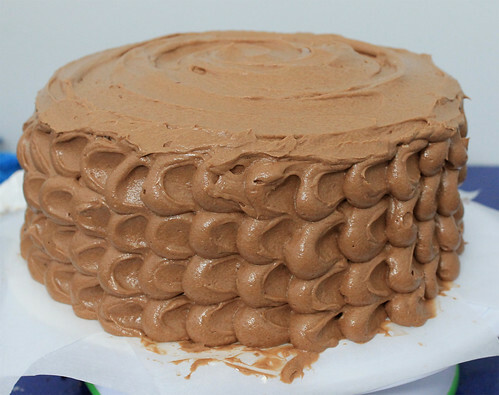 The chocolate cake is oil-based, yielding a super moist cake. 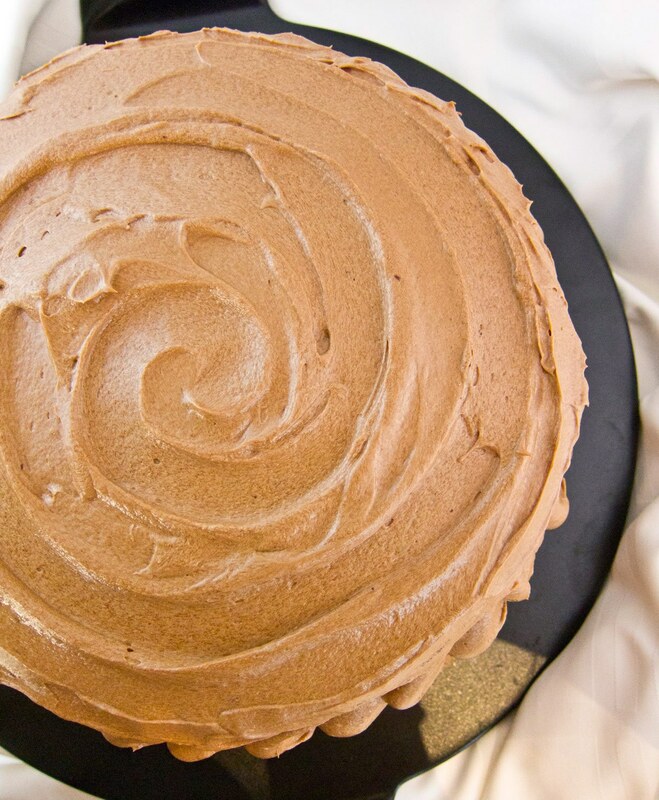 It is sinfully rich and fudgey, thanks to the one cup of cocoa that goes into the recipe. The addition of a cup and a half of coffee only helps intensify that chocolate flavour. Usually when I bake cakes ahead of time, I wrap them up in a double layer of plastic wrap to help lock in the moisture until I frost it the next day. I didn’t even have to do that with these cakes—they were so moist that I just stacked them in my carry cases, with only a sheet of parchment between each layer to prevent sticking. Apparently, longer than I thought. 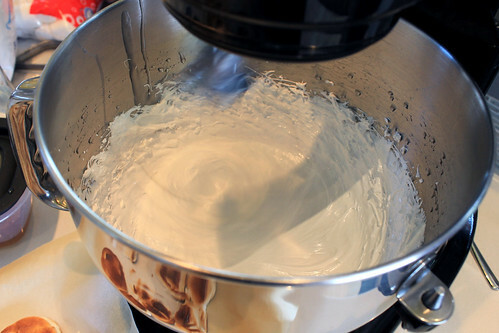 I didn’t want to cheat and buy marshmallow fluff from a jar when I could easily make my own. However, the do-it-yourself version requires patience—something I don’t always possess. You can't rush the process, as you wait for the sugar syrup to reach the soft ball point (240°F), and then again as you get the temperature of the marshmallow fluff back down to room temperature so that you don't turn the butter into lava when making the filling. I did end up using commercially made marshmallows though, which was just fine. I find homemade ones tend to be a lot softer and gooeyer, and I'm not sure how well they'll hold up under the broiler. 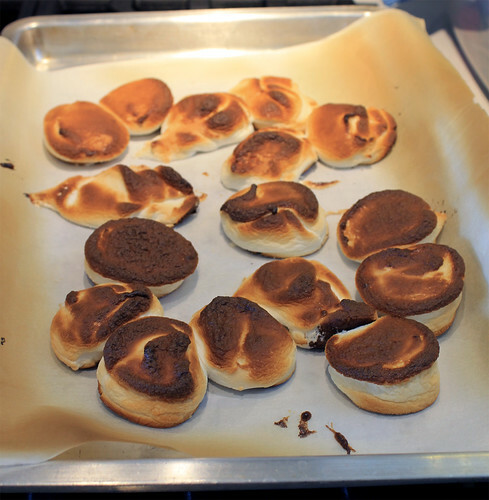 Be sure to keep a close eye on them as they broil—they toast very quickly and it takes only a matter of seconds to have perfectly golden-browned marshmallows to lumps of charcoal. All that work just to make the marshmallow cream filling is totally worth it though once you taste it—delicious light and delicate, rich on the vanilla flavour, and speckled with bits and pieces of toasty marshmallows. Next came the buttercream. I doubled the buttercream, and I’m really glad I did; otherwise, I would have quickly run out before I had even frosted half of the cake. Along with reducing the sugar, I reduced the quantity of chocolate that was asked for , as I was using a dark chocolate and I really wanted the malt flavour from the Ovaltine to stand out in the buttercream. I really wanted to do some kind of piping on my cake, but am terrible at the art of piping. So I was thrilled when Foodology offered this neat trick of piping blobs of frosting, and then flattening it out with the back of a spoon. It’s super easy and it looks great. The next time I do this method, though, I'd stick the buttercream in the fridge for about 10 to 15 minutes just to solidify it and make it a little more stable for piping. While the buttercream generally held up, it was quite soft for piping, and I watched with dismay as each perfectly piped circle started drooping a millimeter or two after it left the piping bag. All in all, I’m quite happy with the way my cake turned out. There’s a lot of cake here, but there were 13 people that needed to be fed (plus an extra slice for taste testing at the end of the day). Despite looking like a pretty heavy cake (it definitely felt heavy as I was transferring the cake to a platter), it actually is fairly light, given all the chocolate and marshmallows in it. The cake has a pretty light crumb, and the marshmallow cream is delicate. I just hope it freezes well, as I’m sure most of us put our slices of cake away when we got home, to be enjoyed at a later time. Post taste-testing, while we were all sitting around in a major cake stupor, someone had asked the group who would make their cake again. My answer is yes. While I wouldn’t make it anytime soon, I did love all the flavours of the cake, and think it's definitely worth making it again for a special occasion. It certainly wasn’t hard to make; it just requires some time to put all the different elements together. 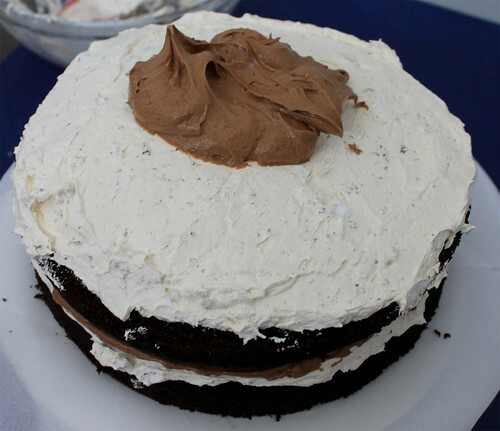 And if it means I get to have more of that marshmallow filling and malted chocolate buttercream, then bring it on!